Hello everyone! 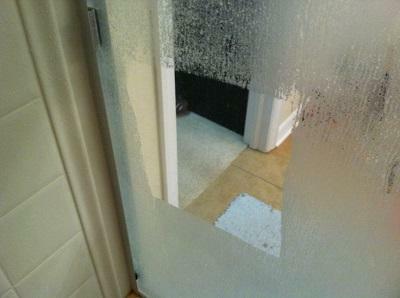 Today I am going to talk about my first shower door hard water stain removal in Spring, TX. Here at SMC cleaning services, we have been offering hard water stain removal for over a year, but last week was the first time that I have attempted a shower door. We remove hard water stains by applying a mixture of natural mineral powder and water to your windows. We then use a steel wool pad attached to a orbital buffer to remove the hard water stains. Sometimes the stains will be removed with one pass, but most of the time it take 3-4 passes to fully remove the hard water stains. This can be an extremely messy process if you do not take the proper precautions. I will talk in the next paragraph about the steps I took to properly remove the hard water stains in Spring, TX. So as I talked about before, hard water stain removal can be a messy process. When the orbital buffer is spinning, the mineral powder mixture tends to get thrown straight up in the air. This could be a problem while cleaning a shower door because you do not want to get a homes ceiling dirty. My solution was to cover the entire shower enclosure with a plastic tarp and tape it to the wall and shower enclosure. The homeowner even called my solution a shower tent...lol. This worked great until I learned a very valuable lesson...DO NOT GET THE ORBITAL BUFFER TOO CLOSE TO THE PLASTIC. I learned this lesson the hard way when the orbital buffer caught the plastic and wrapped half of my plastic tent around itself. It took about 30 minutes to untangle the buffer and retape my tent. A lesson was definitely learned. The rest of the job went smooth and the customer was very happy. For all of your Hard Water Stain Removal needs in Spring, TX or the entire greater Houston area, contact SMC Cleaning Services for a free quote. Contact us at 281-899-0402 or fill out the form below and we will get back to you soon. Thank you and have a great day.